Renewal by Andersen® carefully selected our windows’ exterior colors and interior finishes to harmonize with a broad range of architectural styles, building trends, and color schemes. Our replacement windows can transform any home’s exterior and boost its curb appeal. You can choose from a variety of colors, finishes, hardware finishes, decorative glass packages, and grille patterns. During our initial consultation, our window experts will recommend the best options for your home’s specific style. Our replacement windows in St. Louis can also improve your home’s energy efficiency significantly. All of our windows feature our High-Performance™ Low-E4® glass that can save you up to 25% on your home’s energy bills. This glass has a low emissivity coating that reflects heat and minimizes heat transfer through the window. This keeps your interior temperature stable and comfortable throughout the year and reduces the workload on your utility systems. This translates to energy savings and a cozier interior. Our replacement patio doors can also make your home more beautiful and energy-efficient. You can choose from hinged French doors, sliding French doors, and siding contemporary doors. You can customize each door type by choosing the best hardware design, hardware finish, grille pattern, interior finish, and exterior color. All of our patio doors also come st andard with our High-Performance Low-E4 glass. This means you won’t have to worry about increased energy bills if you want to let light through our patio doors. 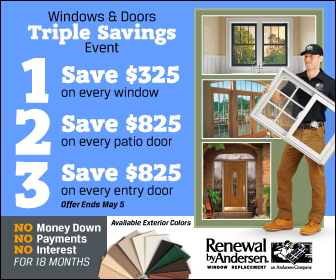 Renewal by Andersen® of St. Louis is the leading choice for replacement windows and doors in St. Louis and the surrounding areas. We can recommend the best windows and doors for our local climate and neighborhood home styles. Call us at (314) 332-2364 to learn more about our door and window replacement projects. You can also ask for a free estimate.